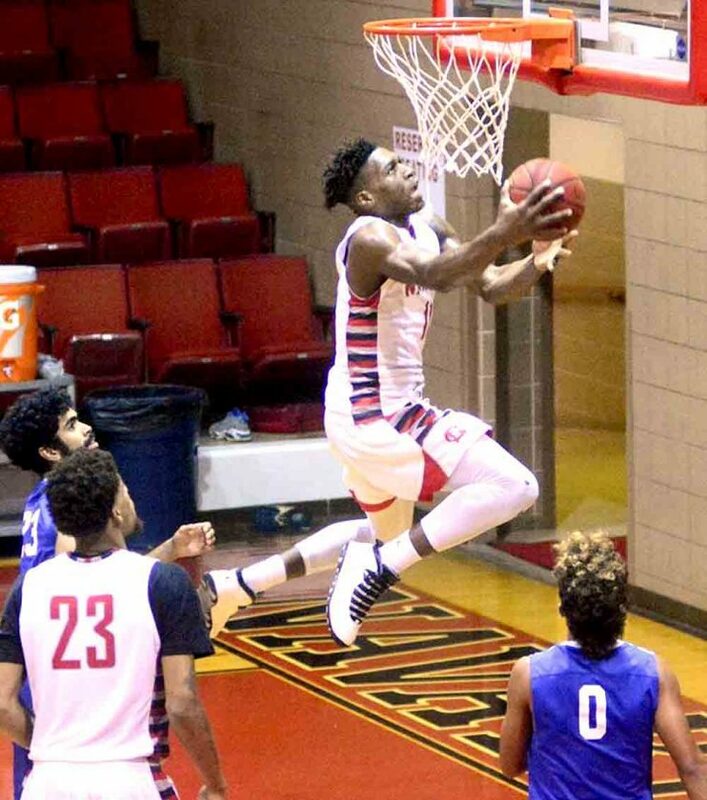 Special to Tribune Chronicle / Navarro College Former Warren G. Harding standout Shakem Johnson drives to the basket while playing for Navarro College in Texas last season. He will be playing at Tennessee State University for the next two seasons. Shakem Johnson came into his first Warren G. Harding High School basketball practice as a freshman dribbling and shooting with his right hand. The only thing was, the young player was left handed. It puzzled former WGH assistant coach Mark Komlanc. “Why have you been shooting right handed?” said Komlanc, the current John F. Kennedy boys basketball coach. Former Raiders coach Andy Vlajkovich, now at Canton McKinley High School, knew Johnson had a lot to learn. Komlanc and Vlajkovich saw the young man’s desire flourish over the years and Harding fans saw it come to fruition in Johnson’s junior and senior seasons. That desire continues to push the 6-foot-7 forward who is heading this fall to Tennessee State University where he will have two years of eligibility remaining. The first day he can officially sign is Wednesday. Last season, at Navarro College in Corsicana, Texas, Johnson was ranked No. 50 in the top 100 in the JUCORecruiting.com rankings. He averaged 12.2 points per game and 5.3 rebounds, with a 65.7 percent field goal percentage. He also shot 50 percent from 3-point range. It was Johnson’s second year of junior college as he tried to prove himself as an NCAA Division I athlete. He spent his first season, after leaving Harding in 2017, at Southwest Tennessee Community College in Memphis. There he usually was on the finishing end of an alley-oop or thunderous slam, explaining his high field-goal percentage. He averaged nine points and five rebounds his freshman season. Johnson’s path to Division I status was long and winding. “That’s Shakem’s nature,” Vlajkovich said. “He’s a grinder. I think Shakem has overachieved his entire life. When he came to us as a freshman he had a million deficiencies, but a passion for basketball and a motor were not two of them. He took a little bit of the harder road. Johnson developed a relationship with Southeast Tennessee then coach Jerry Nichols, who left after Johnson’s freshman year to become an assistant coach at Tennessee State. Johnson also stayed in touch with Michael Littlejohn and Damari Moore, who are on the Tennessee State roster. Johnson had been a steady force for Harding, averaging 10 points and 10 rebounds per game. “That was kind of my role I grew into,” he said. “Even when the team wasn’t doing good or anybody wasn’t shooting well, I was always like the energy of the team, get a block or a fast-break dunk. I had to be consistent with it. I couldn’t have energy one night and not have it the next. His numbers might not translate into a high-level scorer for Tennessee State, but that’s not Johnson. It never was. He’ll be playing in the Ohio Valley Conference which this past season was highlighted by Murray State’s Ja Morant, projected to be a high NBA draft selection, and a solid Belmont team. With mid-major teams like Tennessee State, giving a scholarship to a junior college player can be a gamble. Will they be comfortable in their new environment? Johnson checks yes for any questions his new coaching staff might have. “Nashville was closer to home,” he said. “I wouldn’t be as far. I have family in Nashville. I went there so I would be comfortable. I could play and I would be playing against good competition night in and night out. That’s one of the main focuses why I committed there. Komlanc is sure his former player has the tools to succeed in the OVC. Johnson’s game has picked up, having the desire to get better every day, dating back to when he was a freshman at Harding. “When he’s back home, I usually see him,” Komlanc said. “I’m amazed he doesn’t stop, even if it’s just a pick-up game. Guy goes 100 miles per hour. He doesn’t let up until he can’t go anymore. You don’t see that too often. Because of that, I think he’s extremely valuable as a rebounder. His quickness allows him to guard just about any position. He’s big. He’s much stronger now. I don’t know how the shot is. It’s still ugly. He somehow makes them. Johnson said he wants to graduate. 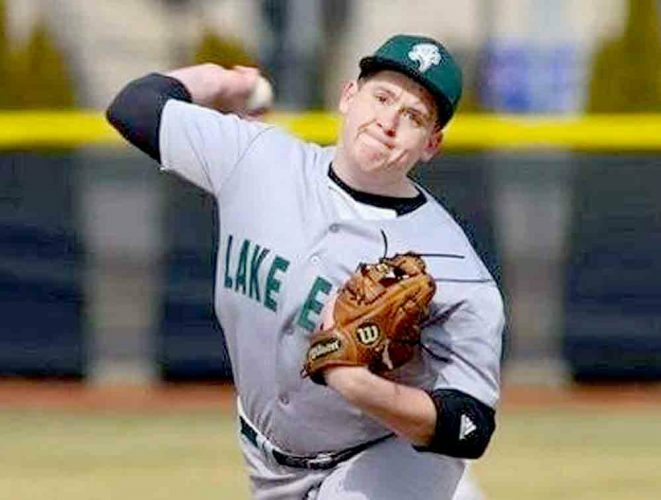 His major is undecided, but is leaning toward business or sports medicine. His goal is to play overseas after he’s done at Tennessee State. “I think he’s got a lot of growth to do for that,” Vlajkovich said. “But I’m going to say this, Shakem probably wasn’t supposed to play high school basketball. I think a lot of people saw Shakem as a freshman said, ‘There’s no way this kid is going to contribute in the way that he did.’ Nobody ever thought Shakem would be a Division I player and he was. Shakem definitely has some deficiencies. He knows that. It’s not a knock on him. It’s just Shakem. It wouldn’t surprise me one bit if he played overseas.